nesdev.com • View topic - Good looking 8x8 or 8x16 pixels sprite games? Good looking 8x8 or 8x16 pixels sprite games? Post subject: Good looking 8x8 or 8x16 pixels sprite games? Are there any good looking games where the characters are 8x8 pixels (a single sprite)? 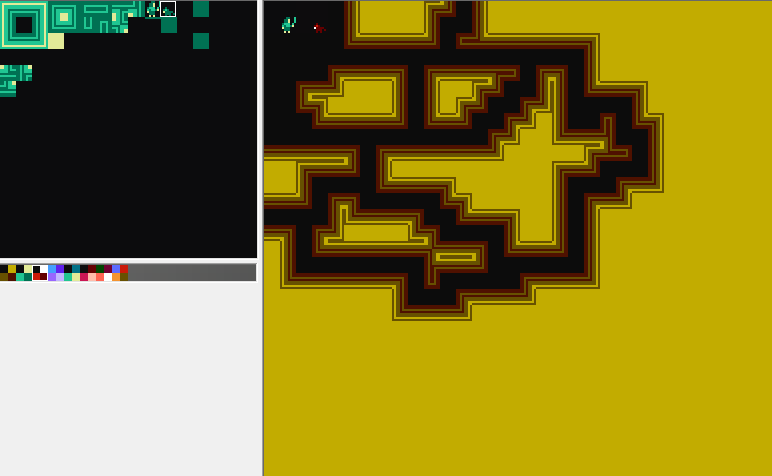 Preferably with a background collisions on single tiles too, even though that may prove computationally expensive. Or maybe a game with 8x16 sprite mode where it's still a single sprite. I've had this on my mind for a while to try and come up with something but I haven't the time for all the ideas I have. I was just wondering if someone already did some game in those lines. A game on these restrictions could make for interesting designs in gameplay, and also be a challenge to make it look good, which would make it very impressive if it did. 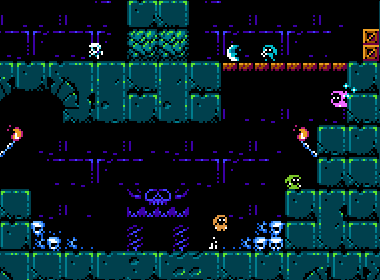 Post subject: Re: Good looking 8x8 or 8x16 pixels sprite games? Sly Dog's Snail Maze uses 1 8x8 Sprite. And the Micro Knight games. Yeah I did a little test here and surprisingly (not) the sprite looked like a lemming and the playfield became a maze. Still far from looking good, and it seems really hard to do that. edit: didn't see Kasumi's post. Yeah that looks amazing! I see it does that 8x16 sprites mode. Well done indeed. And yes, mmc5 would be the mapper of choice for this. Last edited by nesrocks on Sun Jun 10, 2018 6:28 pm, edited 1 time in total. Have you seen this? Morphcat says on twitter it'll go on kickstarter soon. really good use of 8x8px actors to help with the 4 simultaneous players-centered design. Amazing!!! Yeah I thought that it would benefit 4 players gameplay. The characters are beautiful and the bg art too. Actually way better than I thought possible. Although only some of the elements are 8x8, still, the most important ones are (the players). Those are really nice looking! It is clear what they are and what they might do, + i think they have a bit of personality to them despite the low resolution. This topic reminds me... Someone i know who's actually attended to game design classes and not just winging it from other random fields of experience -like me- made me aware quite recently that players will initially notice colour, then form. It might sound like a basic concept but it hadn't occurred to me before (i tend to put focus into the guiding aspect of animation and timing). With such a limited resolution to design a character, i'm thinking that using colours to convey messages about function becomes all the more important? Not that it is mandatory, but probably a helpful tool, still. Can't believe I forgot about Micro Mages! But I guess it's way easier to come up with not specifically NES things. Last edited by Kasumi on Sun Jun 10, 2018 6:13 pm, edited 1 time in total. Smash TV uses 8x16-pixel sprites and doesn't look like complete crap. @Frankengraphics: yeah, I think that at this resolution every aspect has to be really well done. When a single pixel is 1/64 of the image (or a lot more because you're probably not using all 64 pixels) you really need to make it count more than ever. I think he is right that the first thing to be noticed is color. It's also what makes us "group" things together. @tepples yeah, the characters look so big! Hard to believe that they are 8x16, but I checked, it's true. Last edited by nesrocks on Mon Jun 11, 2018 9:17 am, edited 1 time in total. 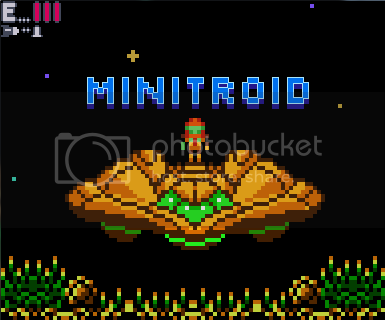 Huh, that Microvania shot reminds me a tiny bit of Jetpack (video game). Any decent TI83 game had to make do with monochrome 8x8 sprites, and some of those games manage to look amazing despite that. 8x8 sprites, all monochrome. It helps if you think of them as 10x10 sprites with a forced black outline. Last edited by Dwedit on Mon Jun 11, 2018 8:45 am, edited 2 times in total. Not that i know of any such game for the NES, but 8x16 hardware sprites without a meta level should do very well in sports games (maybe isometric ones?) where you need to view a large field and/or there are a lot of players. Football, soccer, etc. Maybe also real time strategy games (i guess the former might kind of fall into the later category). Tecmo Super Bowl uses 8x16 sprites for the players on the field. 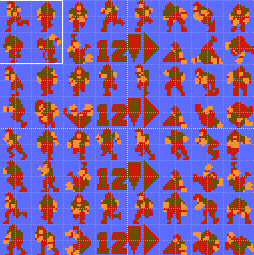 I don't think that's quite right... More like 2 sprites totalling 16x16 so it's like most games (16x16 characters).